From rural Kansas to the final frontier and everywhere in between! Actor Phil Morris has brought heroes (Martian Manhunter) and villains (Vandal Savage) to life and has soared with the crew of the Enterprise. Today, he’s hangin’ out in the Lair and talkin’ about comics! The Burning has taken over J’onn J’onzz’s body and the Justice League must defeat this enemy and help J’onn regain control. 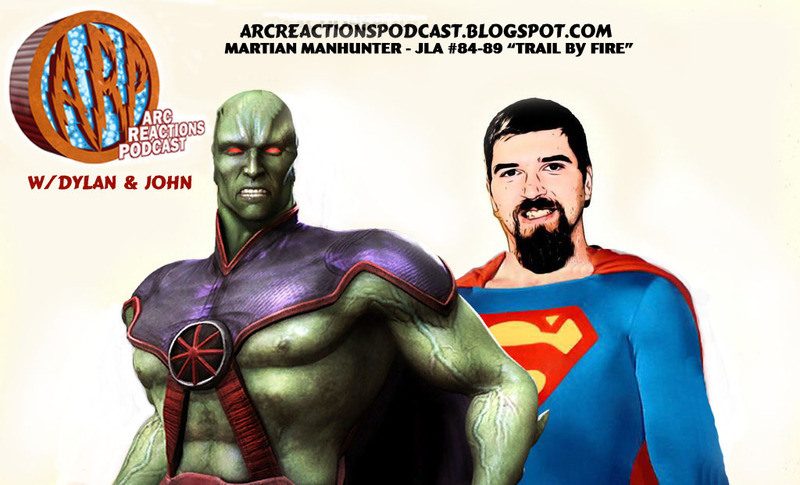 We talk about the story, Martian Manhunter, our favorite Justice League lineup and more. Our next podcast will be our coverage of Captain America: Civil War (film) on May 8th. Our next Bat Books For Beginners episode will be Bruce Wayne: Murderer? on May 17th. Only in a world where gods live among us, also known as the DC Universe, can a martian fly under the radar. Martian Manhunter has been surrounded by the likes of Superman, Wonder Woman, the Flash, and Batman since his inception in 1955 and although he’s been a fan favorite for decades, Martian Manhunter has a loyal following of fans who want to see and hear more from their favorite character. WATCH: DC Comics Fan? ComicsVerse’s Chris Massari interviewed the creative team behind DARK KNIGHT III: THE MASTER RACE at this year’s New York Comic Con! When ComicsVerse decided to do a series on the best underrated characters in comics, our DC Comics audience was singularly focused on ensuring we feature Martian Manhunter in an episode. It isn’t difficult to see why he holds an exalted place in the hearts of his fans, Martian Manhunter has a moving character history, is chalk full of some of the best superpowers a superhero can have, and to top it all off, Martian Manhunter has been written to portray some of the most human qualities a comic book character can have. That’s pretty impressive when you consider the fact that he’s technically not a human being, he’s a martian! His wisdom, his naïveté about earth life, and his sheer power make for a more rounded hero than most (and a more dynamically powerful hero than Superman). He’s had a handful of solo adventures, but for the most part, is in the background of the Justice League. He’s an integral team member, and is on the team’s roster more than any other hero, but nonetheless, ends up playing second fiddle to heroes like Green Arrow or Cyborg. LISTEN: Enjoy our character study podcasts? Even if you’re not an X-Men fan, you might love Emma Frost! At ComicsVerse, we want fans of Martian Manhunter, known also on planet earth and mars as J’onn J’onz, that we agree. Martian Manhunter is a creatively depicted character worthy of all the accolades Superman, Wonder Woman, Cyborg, Green Arrow, Green Lantern, and Flash receive. So without further ado, here is the first podcast in our series, “The Best Underrated Characters in Comics” featuring Martian Manhunter! If you’re a fan of ComicsVerse and this podcast, don’t forget to show us some love by leaving a comment, tweeting us, adding us to Facebook, or e-mailing us at info@comicsverse.com! There is no rest for the wicked…or the lazy it seems as Jim and Eric bite their collective thumb at all those other podcasts who used Thanksgiving as an excuse to spend time with their friends and family. Not the Weird Science guys! They take time out from their busy schedule to review every book that came out from DC Comics this week as well as discuss DC Comic News and read and respond to Listener Mail. They are also joined by Reggie for his Recklessness and Jim gives his impromptu Top 5 Books DC is putting out list because certain people didn’t come through with their segment. Enjoy! This episode Peter, Ed, and Chris dive into some comic talk and discuss KING: MANDRAKE THE MAGICIAN #2 (Dynamite), SOUTHERN BASTARDS #9 (Image Comics), CONSTANTINE: HELLBLAZER #1 (DC Comics), MARTIAN MANHUNTER #1 (DC Comics), THE FICTION #1 (BOOM! Studios), and OH KILLSTRIKE #2 (BOOM! Studios).